PRESS RELEASE – Honoring those who have defended their country through service in the U.S. military is a primary mission of the Trojan Phlyers Demonstration Team and they are proud to return to perform at the 2016 Stars and Stripes Air Show Spectacular in Laredo, TX February 14th. The Air Show will include a variety of activities on the ground and performers in the skies. 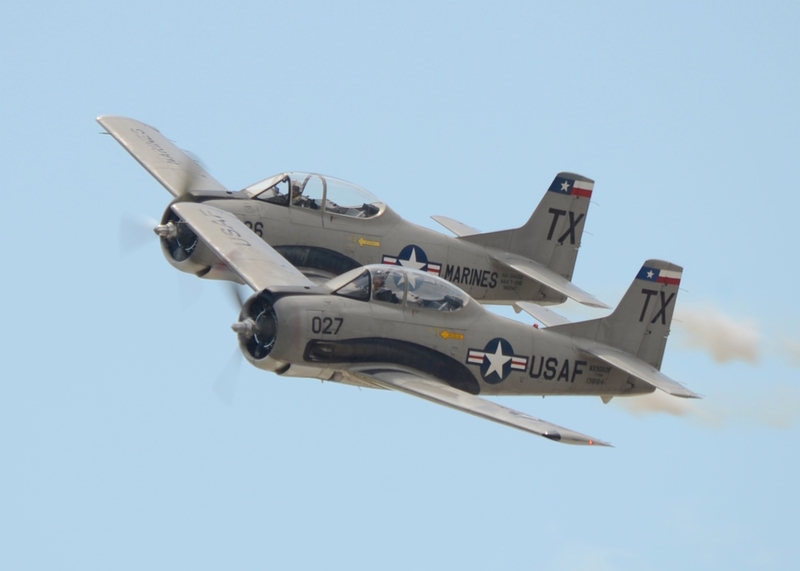 The Trojan Phlyers team is piloted by highly decorated combat veteran pilots performing thrilling precision close formation aerobatic routines demonstrating the cutting edge performance of the Trojan T28 warbird and the flying expertise acquired in formal military training. 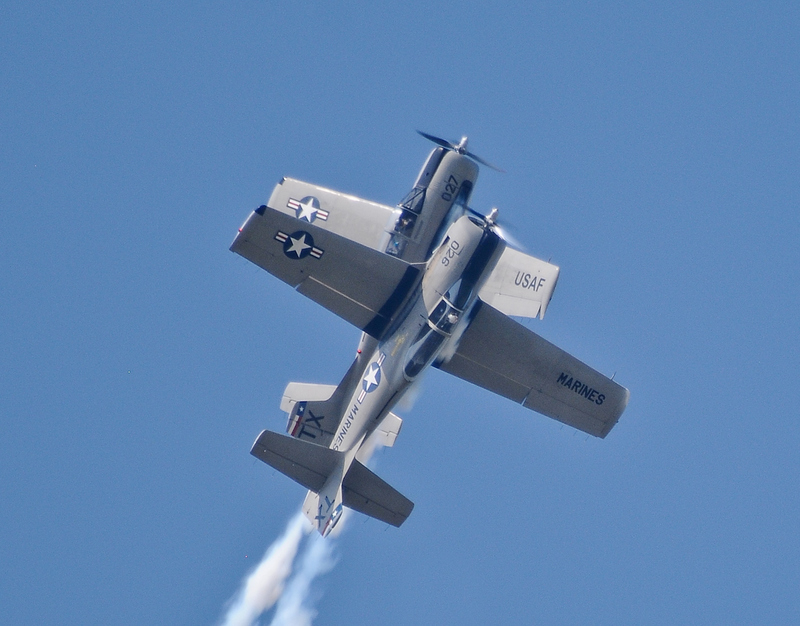 Their show is unique in the air show industry and they are the only all combat veteran pilot team of the T-28 aircraft. The Trojan Phlyers are as exciting as a jet team with their high speed action and the roar of the big engines! 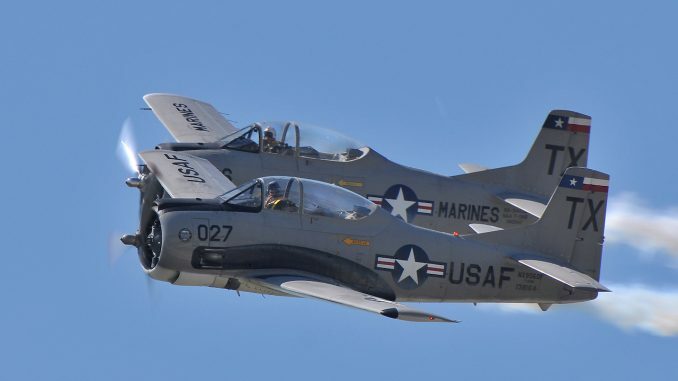 They provide the Smoke, the Thunder and the Excitement as they fly their historic T-28 aircraft rich in military history in an exceptional and awe-inspiring performance and salute the veterans of our great nation and the men and women who continue to serve and protect us today. 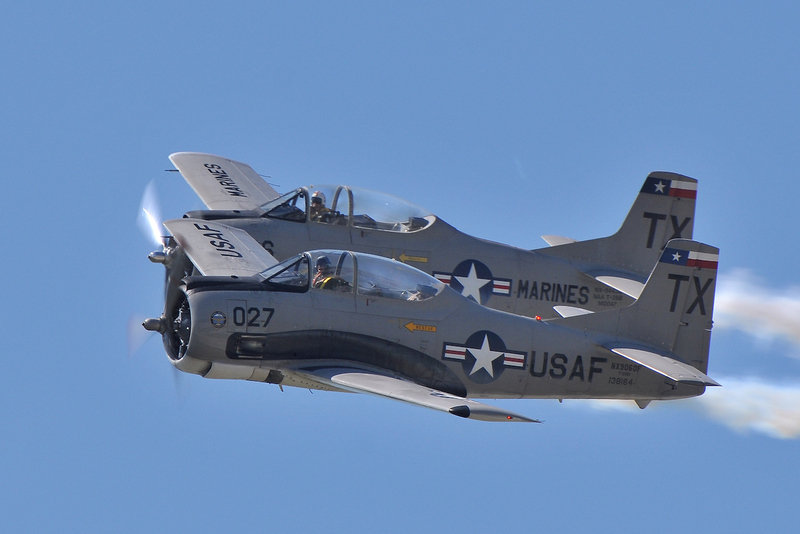 The Trojan Phlyers own and operate two T-28B aircraft. Both aircraft have Wright Cyclone R1820-86B nine-cylinder radial engines rated at 1425 horsepower. The fully aerobatic aircraft can takeoff in less than 800 feet of runway, climb to 10,000 feet in less than 90 seconds, race level above 335 MPH, and dive faster than 380 MPH. In fact, the T28 can outperform most World War II fighters at low altitude and out turn the P-51 Mustang. The two-ship formation aerobatic demonstration team consists of Chip Lamb and John Sledge. Chip flew F4 Phantoms in the active duty Air Force and F16’s in the Texas Air National Guard. He is a graduate of the US Air Force Academy and retired from the US military as a USAFR Colonel after 30 years of service to our country. He is also a retired American Airlines Captain. John Sledge, the demo team wingman, is a retired USMC Colonel having served in Vietnam flying F8 Crusaders from the aircraft carriers, USS Kitty Hawk, USS Ticonderoga, and the USS Constellation. John served in the USMC or the USMC Reserve for 30 years before retiring. He is also a retired USAir Captain. Both pilots are decorated war combat veterans and have some 42,000 flight hours amassed between them. The Trojan Phlyers have been flying air shows since 1995 and have performed at over 150 shows since 2002 from Oshkosh to Acapulco and from New Jersey to California. The Trojan Phlyers’ aircraft were actually used by the US Navy as primary flight trainers. These aircraft were used to teach Navy and Marine aviators basic transition, formation, aerobatics, and instrument procedures and techniques. The aircraft carry the logos of the US Air Force and the US Marines.